Just how special is the close bromance between comic book icon Stan Lee and foul-mouthed cult filmmaker Kevin Smith? So much so that Lee sent his buddy a beautiful ring as a symbol of his affection. The two have collaborated on a number of projects over the years, and Lee is scheduled to make a cameo in the sequel to Smith’s 1995 flick Mallrats (Lee also appeared in the original). The one-of-a-kind piece of ring candy gifted by Lee was modeled after the signature “Fat Man” blue and orange hockey Jersey that Smith loves to don. 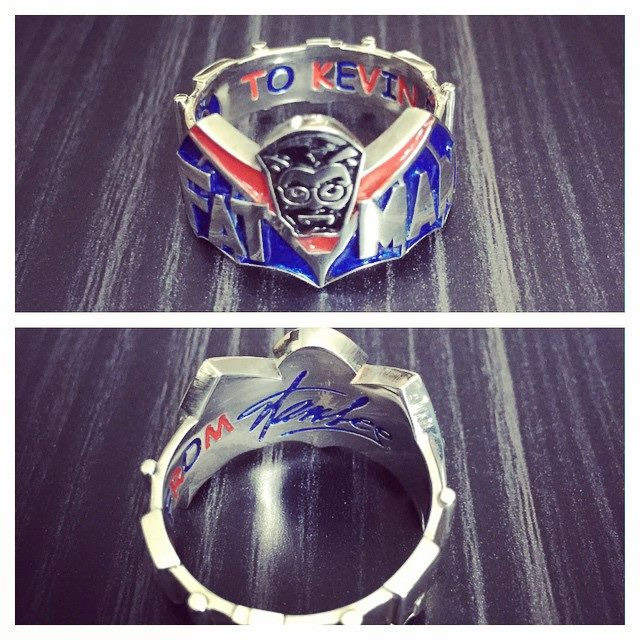 The front of the ring features a likeness of Smith’s face, and inside it reads “To Kevin” and is signed by Lee. How much did Smith love the gaudy bauble? He was over the moon, tweeting, “Dear @therealstanlee – Thank you for this amazing ring! It means the world to me! Unless it means a proposal. If so… YES!” Now that would be a real collaboration.